the ability to store URLs (file names or addresses in the web) in an element. 2 clicks on the element open that document. So i2Brain can collect and govern references to all sorts of data. 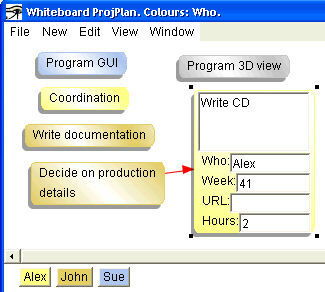 Details of the elements can be changed by dragging and dropping the box to a different column in a column-view, or by editing the details as text in standard input fields. As soon you have input the data, you can change your view of it as you like. In projects containing dozens or even hundreds of elements, you can get a better overview of what is going on, so you understand it better, and you can detect problems more easily. 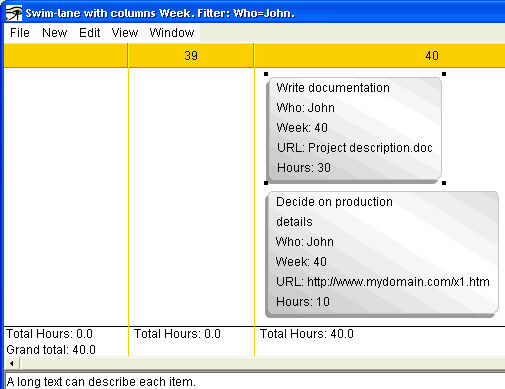 NB: The "aspects" used here ("who", "week", "URL" and "hours") are only examples. You can choose your own freely. E.g. "priority", "which department should take care of an activity", "status" (planned, in progress, finished, tested) etc.